HEY! 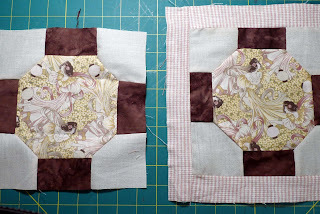 The quilting project is moving along with no real 'news' to report. . . well. There is something I should tell you. I've taken more of an assembly line approach to piecing the blocks. 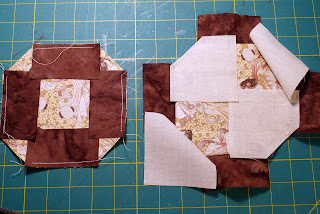 I've determined that it would be best to take the center patterned octagon, then attach all of the brown rectangles, then the cream pentagons and finally attach the cream pieces to the brown ones and attach the checked border pieces. I think this process will move things along a little better. And as it's tedious to keep the start and stop of the sewing lines 1/4" from each end, by doing one kind of piece at a time, it'll become a habit and easier to maintain and the blocks should come out more uniform. The roast from yesterday came out DE-LIGHTFUL! I'm sorry I didn't get a photo taken for you to see it in all of it's fine glory. We served it with low-carb tortillas , shredded monterrey jack cheese, avocado, lettuce, and sour cream. I also made my Tex-Mex corn dip. Unfortunately, didn't have any tortilla chips (I'm certain food just takes a hiatus from the pantry sometimes! ), but we had a few crumbs in a bag. I chose to eat my beef roast on the side and rip up my tortilla for dipping. There was a bit of meat leftover which will reheat nicely into more tortilla rolls over the next few days. Hubster has a great idea for the remaining 'broth.' I think we'll use it as a base for a soup sometime next week. Add some crushed tomatoes and beef or chicken broth and will be tasty as a base for vegetable soup with or without meat. Some crusty bread on the side - yum! I'm looking forward to that. You can find my new-improved and updated Tex Mex corn dip recipe HERE. So what are you making this weekend? Whatever it is - have a GREAT adventurous time.